How do you create more time? Time is a commodity like any other, you simply buy it in the form of qualified assistants, administrators, managers, and sometimes partners. The difficulty arises on how to pay for it and who to pay to take full advantage of these added hours. 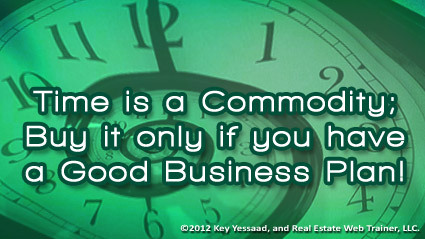 There is a simple way of thinking about ‘time’ in Real Estate: Full Time Agents who desire to earn more than $45K a year need to close One (1) transaction a month, and since they are full time they do not need to buy more ‘time’, all they need is to manage their business hours like hawks; (caveat: this assumes they are well trained agents of course.) Very few agents can move up the ladder of 2 transactions a month on their own; all of us know of some that do but they are rare. In order to achieve 24 transactions a year you need a well-trained part-time physical assistant for 20 hours a week (4 days a week / 5 hours a day.) Finally, any aspiration to go beyond 24 transactions must be grounded with a great Full-Time Administrator, great communication, great systems, and a clear vision grounded on a well-written Business Plan. We are all aware of how a majority of Real Estate Agents squander this precious commodity – maybe we can start there and awaken some of them to the cost of such waste.